MINNEAPOLIS — Arctic Cat Inc. (NAS: ACAT) today reported record earnings per diluted share of $1.30 on net earnings of $17.9 million for the fiscal 2013 third quarter ended December 31, 2012, compared to prior-year earnings per diluted share of $0.92 on net earnings of $17.0 million. Net sales in the fiscal 2013 third quarter increased 5 percent to $218.0 million versus net sales of $207.0 million in the same quarter last year. The company had no long-term debt. For the nine months ended December 31, 2012, Arctic Cat reported the highest net earnings and earnings per diluted share in the company’s history. Year-to-date earnings per diluted share rose 68 percent to a record $3.25 on record net earnings of $44.8 million, compared to prior-year earnings per diluted share of $1.94 on net earnings of $36.1 million. The company’s year-to-date net sales increased 15 percent to $558.4 million versus net sales of $486.8 million in the first nine months last year. Sales in Arctic Cat’s all-terrain vehicle (ATV)/side-by-side business rose 28 percent to $69.6 million, up from $54.4 million in the same period last year. 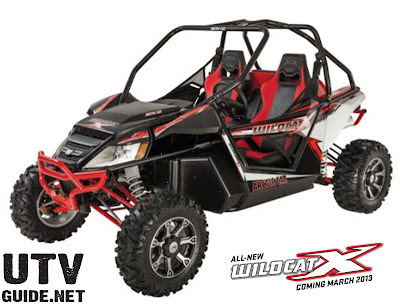 The increase was primarily due to strong global demand from dealers and distributors for the Wildcat side-by-side. Year-to-date ATV/side-by-side sales grew 40 percent to $212.2 million compared to $151.1 million in the first nine months of fiscal 2012. Arctic Cat’s new 2013 model year snowmobiles have received industry awards as the Best High Performance for the F800 Sno Pro RR (race-replica) and Best Crossover for the CrossTour 1100 Turbo. The company’s 2013 model year snowmobiles are built on its new ProCross™ performance and ProClimb™ mountain chassis platforms, both of which offer innovative suspension, drive and braking technologies. Arctic Cat is committed to investing in research and development across its product lines, in order to remain an industry innovation leader and in anticipation of manufacturing its own snowmobile engines. Sales of parts, garments and accessories (PG&A) in the fiscal 2013 third quarter were down 5 percent to $26.0 million versus $27.4 million in the prior-year quarter. An increase in Wildcat parts and accessories sales in the fiscal 2013 third quarter was not sufficient to offset a decline in snowmobile garment sales, due to lower than expected early season snowfall. Year-to-date PG&A sales totaled $77.1 million, down 2 percent from $78.4 million in the year-ago period. For the fiscal 2013 full year, Arctic Cat continues to anticipate increased PG&A sales of 1 percent to 3 percent. In fiscal 2013, Arctic Cat anticipates continued gains in its ATV/side-by-side business, fueled by the growth potential for the Wildcat and Prowler side-by-side offerings, and many exciting new products being developed. Additionally, the company remains focused on further enhancing profitability through operational efficiencies and cost controls. Arctic Cat’s fiscal 2013 outlook includes the following assumptions versus the prior fiscal year: ATV North America industry retail sales flat to up 5 percent; side-by-side North America industry retail sales up 10 to 20 percent; snowmobile North America industry retail sales down 2 percent to up 2 percent; Arctic Cat dealer inventories flat to up 5 percent; operating expense levels that are down slightly as a percent of sales; and increasing cash flow from operations. The company expects gross margins to improve between 20 and 60 basis points in fiscal 2013. For the fiscal year ending March 31, 2013, Arctic Cat now estimates that fiscal 2013 earnings per diluted share will be in the range of $2.75 to $2.85, an increase of 60 percent to 66 percent compared to fiscal 2012. Previously, the company estimated fiscal 2013 earnings of $2.65 to $2.75 per diluted share. The company continues to anticipate sales for the full 2013 fiscal year in the range of $664 million to $684 million, an increase of approximately 13 percent to 17 percent versus fiscal 2012. Arctic Cat added two new members to its board of directors in the fiscal 2013 third quarter. Joe Puishys is president and CEO of Apogee Enterprises and Stan Askren is chairman and CEO of HNI Corporation. Arctic Cat now has eight members on its board of directors, the majority of whom are independent. “We look forward to benefiting from their insights, as we pursue continued growth and enhanced operational efficiency,” said Jordan.